What are you? A Blues or Hurricanes fan? A Mac or PC user? Prefer a Holden or a Ford? Having a discussion (or even argument) around important things that really matter to us is nothing new. I'm currently (enjoying) working my way through an online course, learning more about, online communities and what makes us come together. As shared in a previous blog, What’s the difference between a social network and an online community? an online community is a group of people who develop relationships around strong common interests. This group commonly crosses boundaries to come together (age, interest, abilities, needs) where relationships become incredibly important, as we turns an audience (viewership, lurkers, likes) into a community (interactive). It starts with strong common interests, then an interaction or spark is created, community members (us) are invited to disclose some information about themselves (experiences, facts, emotions) which in-turn creates an emotional connection where relationships will start to develop. Without interaction, we are just building an audience. Strong common interests is what is going to drive our community, ie: what do they want to spend our free time talking about? Some people like to talk about lifestyle products, hobbies and what they spend their time on, emotional reaction to causes, sport teams, events etc or what identifies us - from brands to job/work related conversations. Some people like to argue Ford vs Holden, others...Mac vs PC. What is our strong common interest in edSpace? I see our community growing when people are joining as part of a course/event, project or programme and some even arriving after a notification, nudge or a shoulder-tap. I think we can come together to talk all things education, to share experiences and help each other in our mahi. What do you think our strong common interests are? Circumstances: When you're put into a situation, sometimes not by choice. How of these communities do you belong to? What makes these forums work for you? While we would readily recognise edSpace is our community of practice (we're all in the same industry and share the same jobs), we could also turn this into our hybrid community - a mixture practice and action. ie: edSpace offers an online space for passionate educators can talk about our mahi as well as reflect on things (way we think/act) that make a difference in education for our tamariki. We can do this freely amongst ourselves within a safe, open environment. What would you like to see more of, so that edSpace works as an community of practice and action for you? Feel free to comment below. Here's a bit more to our story about our very own online community of practice in the latest blog post in CORE's blog edSpace our networking frontier. Can you see yourself in this story? 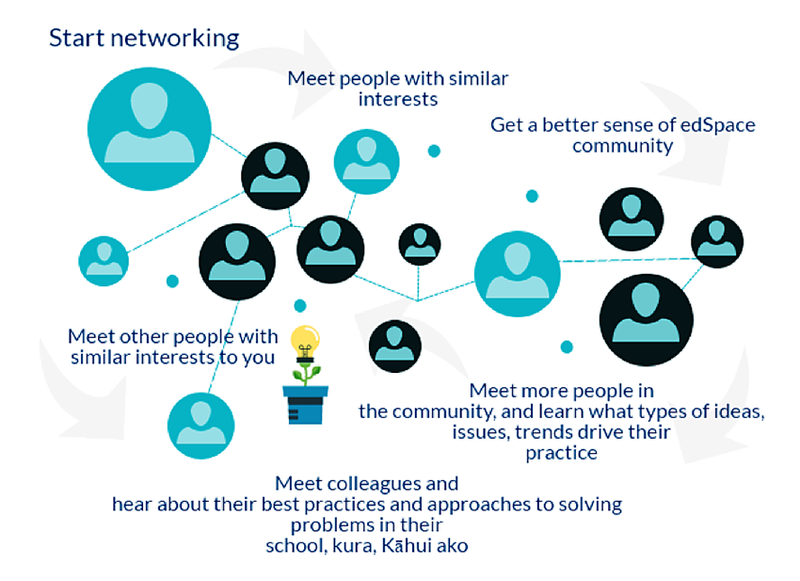 We'd love to hear more about the connections you're making, as a result of networking in edSpace. Might just inspire others to do the same. Just a thought about the impetus for joining an online community and then staying in it. I have joined some of the groups in Edspace, I have also created a couple. Why did I join them or create them? And why have I chosen the ones that I have? If I am honest, the initial reason to join was to support you and your mahi. You are so passionate about it that I couldn't help but want to jump in and have a look around and explore. It may also be that I felt a sense of duty or responsibility since this is 'our' space and as a CORE employee, I should support the product. But I didn't have to and we know that many haven't engaged. Why is that? Well, I think that partly it comes down to friendship and relationships. I trust and respect you so I trust in your ideas and your passion that EdSpace is a good place to be. I am a loyal employee, I have a good relationship with the company and I want to support. Maybe if those relationships didn't exist, I wouldn't have been so quick to jump in? But that's not to say that those who haven't jumped in don't have a respectful and trusting relationship either with you or CORE! So there has to be something else, right? I have had a positive experience already in online communities. Communities in which I have been welcomed, where dialogue and discussion have been challenging but positive and warm, where I have become 'friends' with others who are also involved in them. Some of those virtual friends have become 'real' friends! I am also always game for a challenge, happy to try things out, open to new spaces and ideas. So perhaps the willingness to get involved is about disposition too, about personality and about prior experience. If someone has had a poor experience in one online community, they are likely to be less confident or willing about getting involved in another. If they are naturally reserved or risk-averse, they may not want to take the step. Then I think about the times that I have had good experiences in online communities. What were the circumstances which prompted me to join? Mostly, because there was a clear purpose. When I first joined Twitter (which I know is not quite an online community like this one, but it is a community, and it is accessed online! ), I really didn't engage. I joined because it was new and because a couple of other people I knew had joined, but for a couple of years, I really didn't engage. I didn't have a purpose, I didn't know what to do or say. Then, I went to an education conference, I was on my own and although I was in the middle of masses of people, I didn't know anyone. BOOM! there was my purpose - the twitter feed was displayed on the screen, people were sharing ideas, I needed to capture those ideas, it was a way of connecting to people and having a conversation about what was energising me and exciting me about the keynotes. Curiously, I became engaged in an online community whilst I was in the middle of thousands of people! Weird, I know! Another online community was in a MOOC. The first MOOC (and the best) that I was involved in. The online discussions in that MOOC were brilliant. I communicated with people from all over the world, across time zones, on some amazing topics. We challenged each other, shared resources, peer-reviewed artifacts we created for the MOOC, questioned and celebrated. So, purpose is key. The groups I have created in EdSpace have had mixed success. The first really was right at the start and I don't think there was anyone really there to join it except CORE facilitators. I created it to try to get some discussions going about Guy Claxton and his theories on Education as I was working in a school who had adopted his ideas as a basis for their teaching and learning. It has flopped big style. Was that because, whilst I had a purpose for creating it, there was no purpose for anyone else to join it. Since nobody joined, I stopped going there. Nor did I really populate it with any jewels - there didn't seem much point in putting effort into something that was empty! The second group I have created is for a group of teachers with whom I am working. They are sole charge principals in 5 schools. We meet together roughly once a month face to face and have really robust discussions. I wanted a way to keep those ideas sparking in between face to face visits. So I broached the idea of an Edspace group. They were a little nervous but were willing to give it a go. It is still in its infancy, but we are gaining traction. One of the teachers is more engaged than the others, so she and I are really keeping it going. I use it a little like a 'classroom' space where I post pre-workshop thoughts for them to consider before our sessions together, and post-workshop reflection activities. We have also added resources and links to readings, videos, and articles pertaining to the topics we are exploring, but also for other things that come up out of left field as we discuss face to face. To help them get involved, we have the first 10 minutes of our face to face sessions discussing any ideas that came up in the online discussions. That gives those who didn't have time to get online in between, a chance to see what the others had said and maybe that will also engender a bit of FOMO too! I can't make them engage, I can only provide a space that is welcoming and interesting to be in. And of those in the space, there are a couple who either aren't comfortable discussing online or who as yet are not comfortable with the technology so they contribute less although they say that they read the others' posts. They need to be supported because they do see the purpose of it. For them, it is being able to continue conversations that otherwise they wouldn't be able to have as they all go away to different schools. My challenge now is to keep the interest going, encourage them to be proactive in the group rather than only reacting to my posts, get them to join other groups and see what others are doing in areas they are interested in. I have considered trying to get other schools I am working in online too. But they are in a different position to my Sole Charge Principals. They already have a space in which they can share ideas on a regular basis - a physical space - their staffrooms or workrooms in school. They don't see the point yet of sharing and discussing their experiences and ideas more widely. I am sowing seeds. Helping them to see what the benefits might be. Encouraging those who are more open to join individually and find some groups to get involved in. But for the time being I am encouraging ideas sharing in other spaces as part of the mahi. Maybe they will get there.